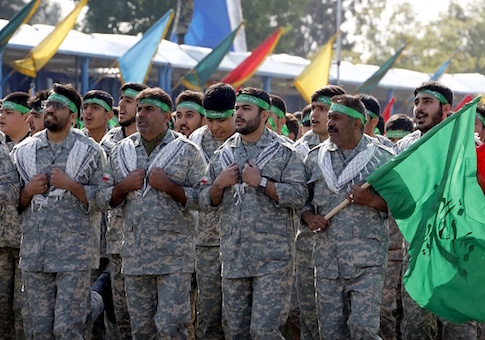 Iranian military leaders announced on Thursday that the Islamic Republic would be launching a "massive" set of war drills later this week that will include the regime's Army's Ground Force and some 12,000 "combat and mobile forces," according to Iran's state-controlled media. "The massive Eqtedar 97 war games of the Army's Ground Force will be staged for two days in an extensive area of Isfahan region on Friday," Iranian General Kiomars Heidari, commander of its ground force, said on Thursday. The military leader disclosed that "different home-made weapons will be tested in the drills and various types of military equipment, including helicopters, drones and fighter jets will be used" in the war games, according to a report carried in the semi-official Fars News. The military display is meant to send a message of reassurance to regional allies and one of warning to "enemies" of the Islamic Republic, Heidari said. "The message of wargames for the friends of Iran is that they can consider the country's military capabilities as part of the power of Islam's army, meantime, adding that the Iranian army is always ready to give a crushing and quick response to any aggression by enemies," Fars reported. Iran conducted similar military drills earlier this month. Those war drills included heavy bombers and large refueling planes, such as those made by Boeing. Other types of large transportation planes and drones carried "precision-striking missiles and long-range smart bombs," according to Iranian military leaders. Meanwhile, Iraqi militia leaders operating in contested areas of Iraq disclosed this week Iran and its terror proxy group Hezbollah are responsible for teaching these jihadists how to build improvised explosive devices, or IEDs, that were used to kill and maim U.S. forces in the country since around 2004. Sheikh Akram Al-Kaabi, the Al-Nujaba militia leader, disclosed the extent of Iran's footprint during a wide-ranging interview earlier this month. "The brothers from Hizbullah and from the IRGC helped us in that battle in Najaf. Even in Sadr City, there were Iranian consultants. There was an IRGC officer called Abu Ali, who was originally from Ahwaz and spoke fluent Arabic," Al-Kaabi said in an interview on the militant group's television channel that was subsequently translated by the Middle East Media Research Institute. "He was with us in Najaf, and he helped us with the battle management and provided much-needed basic and important advice," he continued. "We realized that if we use these capabilities and expertise in a more extensive way, we will have better results." "One brother, called Abu Turab, was known to all the brothers in the Mahdi Army," he disclosed. "He was with us in Baghdad also. This brother from Hezbullah specialized in engineering and had a lot of expertise in matters of combat. He trained many of our brothers. Our chief engineer in Najaf, Dr. Jassem Al-Abadi, who was martyred, was among the first to be trained by that brother from Hezbullah and by the brothers from the IRGC," Iran's paramilitary group that operates outside of its borders. "So we realized that if we acquired more capabilities, things would improve," Al-Kaabi said, praising Iran. "Our morale was high. Our mujahideen were ready to make sacrifices. So we decided to take this path and acquire a lot of expertise. So we developed our relationship with the brothers in Hizbullah and the IRGC. Both Hizbullah and the IRGC were open with us about everything."